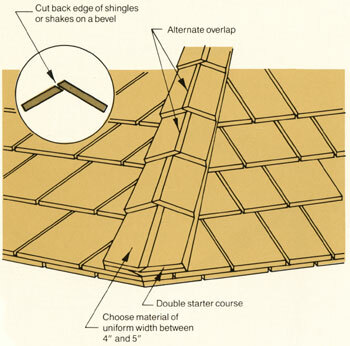 Intersecting roof surfaces at hips and ridges should be capped to ensure a weathertight joint. Site-made or factory-assembled hip and ridge units may be used, but both types must have alternate overlaps and concealed nailing (see Fig below). Weather exposures should be the same as the field of the roof. Nails must be longer than those used on the field of the roof and of sufficient length to penetrate 1/2" into or completely through the sheathing.